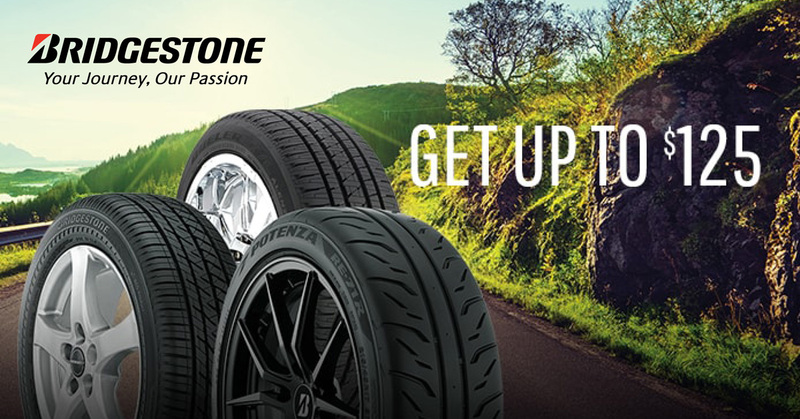 Up to $125 Bridgestone Rebate! Disclaimer: †Claim form required. Limit 1 reward per each set of 4 eligible tires purchased; limit 3 rewards per household, customer or address. For eligible tires and complete details, see your participating Bridgestone retailer or BridgestoneTire.ca. Eligible tires must be purchased in store from a participating Bridgestone retailer's inventory March 15 -May 6, 2018. OFFER EXCLUDES COSTCO AND ONLINE PURCHASES. Cannot be combined with any other offer. Visa (Get up to $125 by mail on a Bridgestone Visa* Prepaid Card**) The Visa Prepaid card is issued by Peoples Trust Company pursuant to a license by Visa Int. *Trademark of Visa Int., used under license. No cash access or recurring payments. Card valid for up to 6 months; unused funds will be forfeited at midnight EST the last day of the month of the valid thru date. Card terms and conditions apply, see MyPrepaidCenter.com/site/visa-univ-can.